In the beginning of February, I happened to find a really interesting Facebook wall. Although the page was new and only had a few fans, the updates on the wall looked ambitious and promising. Today, when I check the page, I see a community of more than 19,000 fans all in the span of a month! Now, isn’t that impressive? 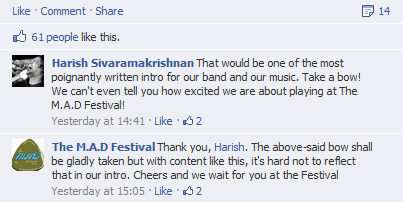 I’m talking about the M.A.D (Music, Arts, Dance & Destination) festival page on Facebook. This once in a year festival celebrating music, arts and dance also promotes India’s most fascinating destinations and this year the festival is all set to come about in The Fernhills Palace, Ooty on the 5th, 6th and 7th of April. Three days of live performances and workshops with artists from across the world and a flea market to boot for. As far as I can see the Facebook page, there have been no contests whatsoever to promote the event asking you to ‘like’ them before participating and no other incentive other than giving you an experience of the festival that is to come. So engagement is probably the only reason to attribute for this massive fan growth. I decided to explore more. The first thing that deserves a mention is that they have upgraded to the timeline for brand pages with a rather interesting cover page. Many brands are yet to implement this fascinating feature. Next would have to be the welcome page; it is informative and appealing as well as with a call-to-action, which is just as much as required in a welcome page. If you like what you read and plan to go for it, there is a link where you can buy your tickets from. Objective, objective, objective: Yes, its all about why you are on Facebook and what you hope to achieve from it. If you want to build awareness, then go on build it but do make sure you don’t end up selling instead. 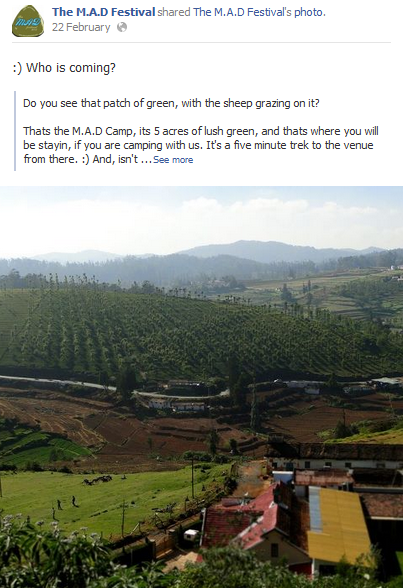 The M.A.D festival only talks about what you are going to experience in the 3 days of the event and the breathtaking beauty of the destination they have chosen for you this year (Ooty this time). Not once do they beg you to buy their tickets. Be who you are: You can’t afford to be fake in social media. Honesty is the best policy here too. For example, if you look at the update for International Women’s Day, it does not pretend to be ‘the’ brand wishing you just for the heck of it but takes a stand for what they believe in. Respect your community: Appreciate and be respectful of your loyal fans. Thank them when they deserve it. 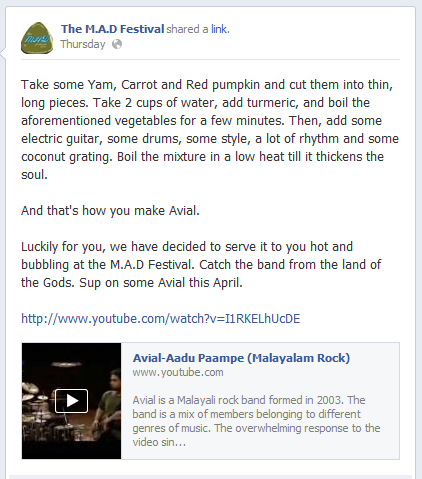 Here is a screenshot of an update where the brand is being appreciative and thankful, which is a rarity in most Indian brand pages. The 10% discount on the ticket shows the gratitude here. Stick to your passion: Do not discuss cricket or politics because your nation is addicted to it. If you are expected to talk about music, arts and dance, then talk about just that and that alone. The updates on the wall only talk about music, dance and arts despite having a wonderful opportunity to post about the furore generated by Akhilesh Yadav by winning the elections or the sad departure by Rahul Dravid from cricket. Have a ‘human’ persona: People like to deal with people and not logos or robots without any semblance of moods, emotions or opinions. Even with a display picture of a logo, you can have a human conversation like the M.A.D page admin. Though, it remains to be seen whether the M.A.D festival page will survive post the April event, as most event based pages simply die down after that. I would be really sad to see this one bite the dust. So, if you are reading this, M.A.D, please carry on building this fantastic community. In case of readers who have enjoyed the Facebook engagement by M.A.D, please share what you feel about it in the comments.